Xiaomi Mi Max smartphone measures 173.1×88.3×7.5mm and weighs 203 grams which compared to Huawei P9 Plus, the Mi Max is 20.8mm taller and 13mm wider. It sports an all-metal body and will be available in three colours – Dark Grey, Gold, and Silver colours. With the launching of Xiaomi Mi Max smartphone, Xiaomi also announced 3 months of free movies on Hungama Play and 1 year of unlimited music on Hungama Music for the first 1 million Mi Max, Mi 5, and Redmi Note 3 users, and free Batman vs. Superman movie streaming for the first 10,000 Mi Max users. 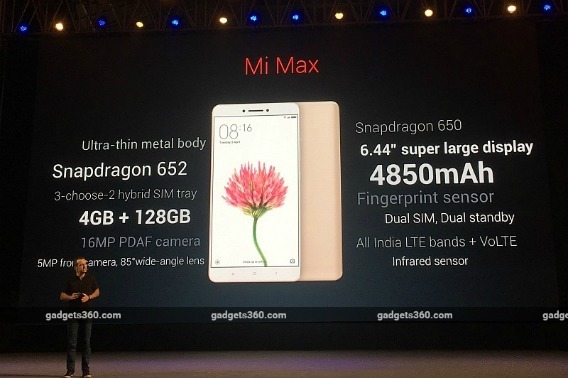 Xiaomi Mi Max will be available from Mi.com start July 6 with priced at Rs. 14,999.